It’s the middle of the summer, and outside the sun is baking the pavement. Maybe you’re at work in a nice air conditioned office, or perhaps you work outside and you can’t wait to finally get home and relax in your nice air conditioned home. But when you get home, it doesn’t take you more than three seconds to realize that something is wrong. When you open the door to your house, there are three very distinct aspects of the air that hit you: it’s still, it’s humid, and most annoyingly, it’s far too hot. You head to the thermostat and everything appears as you left it…something’s obviously wrong. After checking to make sure that your pets have enough water, it’s time to call an AC repair service. But what happened? When you left this morning, everything was nice and chill; now it’s 85 degrees inside. Open up some windows, get the fans going, and then call JC & JC HVAC Mechanical to find out what kind of air conditioner service you might need. 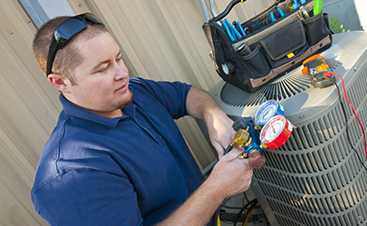 The coils of an air conditioner unit hold the refrigerant that helps to cool the inside of your home. If those coils are dirty, they’re not able to probably transfer the cool temperature from the coils to the air, which means that the entire unit has to stay on for longer in order to do the work that the thermostat has requested. Eventually this can put such pressure on the system that some parts reach the end of their usefulness and break or wear out. Standard AC maintenance will take a look at that state of your hoses to see if there are any leaks. During a call for air conditioner repair, it can be very obvious when there’s a leak, as parts of the outside unit might actually be covered in ice in the middle of summer! Sometimes the hoses can be fixed, other times they might have to be replaced. Either way, our AC specialist can get your leak fixed and your AC up and working again. Air conditioners have a major contention that the rest of the HVAC system doesn’t have to worry about: it’s outside. Being outside means that it’s constantly being bombarded by the elements, including rain, snow, hail, and freezing temperatures. Dust is another problem that can build up over time, because the AC unit filters are preventing the dust from getting into the unit and your home as a whole. It’s also helping to keep out pollen, mold, and other airborne pollutants. It’s a good idea to get basic air conditioner maintenance performed every year in order to clear out that filter. If it gets too dirty, the entire system has to work harder, which means that you’re wasting money and energy. It might not cool as efficiently, meaning that you won’t be as comfortable in your home. Finally, all of that extra work the AC has to do takes its toll; you’ll probably have breakdowns more often. Sometimes it’s not the air conditioner that’s causing your problems. Thermostats have a limited life just like any other electrical device, and eventually it simply stops working even if it says that everything is normal. With you standing there wiping the sweat from your brow, you can certainly tell that everything isn’t normal. There comes a time when getting a new air conditioner is simply the most logical next step. 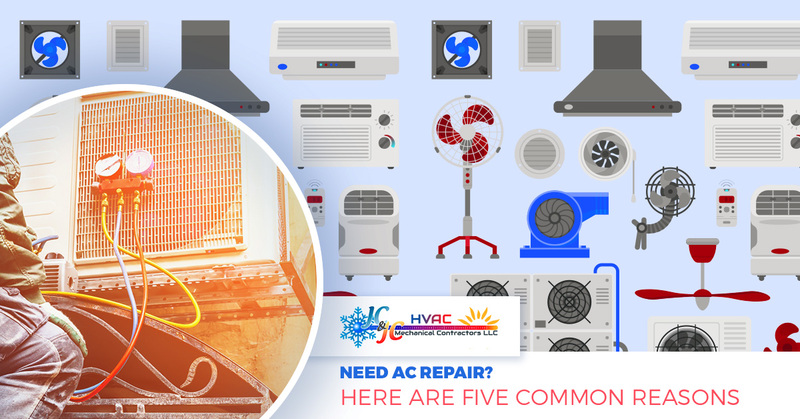 If it’s the third time this summer that you’ve had someone by for AC repair, it should be pretty obvious that something is wrong with your unit and it might be time to replace it. Small problems can lead to big problems, and putting new parts in an old machine could be a waste of money. While you might not want to spend a lot of money on a new air conditioning unit, there are some benefits! Once you have that AC installation taken care of, you won’t have to spend all that money on repairs and you’ll have a much more energy-efficient unit as well. Call Us When Your AC Breaks Down! 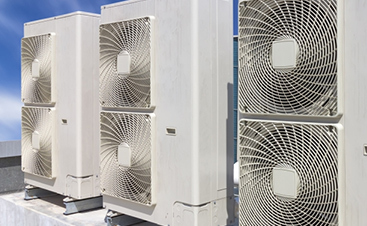 Air conditioning units are complex machines, and the problems we mentioned above are far from the only things that can go wrong. No matter what’s broken in your HVAC system, we’re there to help. 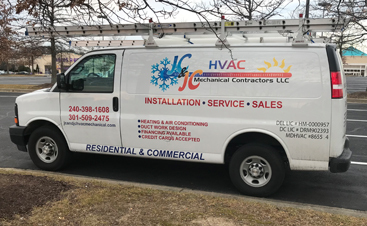 Contact JC & JC HVAC Mechanical at the first sign of trouble!